PRAYER PROMPT ••• Welcome to my back porch. I think I’ve only used one of my own pictures for a prayer prompt one other time. The black lab is my dog, Beth. There’s a Yorkie Poo I couldn’t get in the picture named Sadie. And the brown dog is a houseguest this week – my grand puppy, Natsu. He is my son’s dog, but lives with my mom, and she’s out of town for a wedding. My two dogs are seniors, 9 and 14, respectively. Our houseguest is a highly rambunctious almost-two-year-old. I was worried about bringing Natsu over this week, but the surprise wasn’t him – it was our dogs’ reaction to him. My normally laid back girl, Beth, has had a less-than-hospitable response to Natsu. After a few days, she’s not growling as much, but she’s shown me a side I didn’t know was there! Sadie is being a bit more tolerant, but it’s clear she’s not thrilled about his presence. This morning, as I sat outside with the dogs, reading my Bible, I was in Philippians 2:1-4, and in these verses, Paul encouraged the believers on how to treat one another. We all know everyone is different; not everyone thinks the same; and sometimes, people react in ways we weren’t expecting. 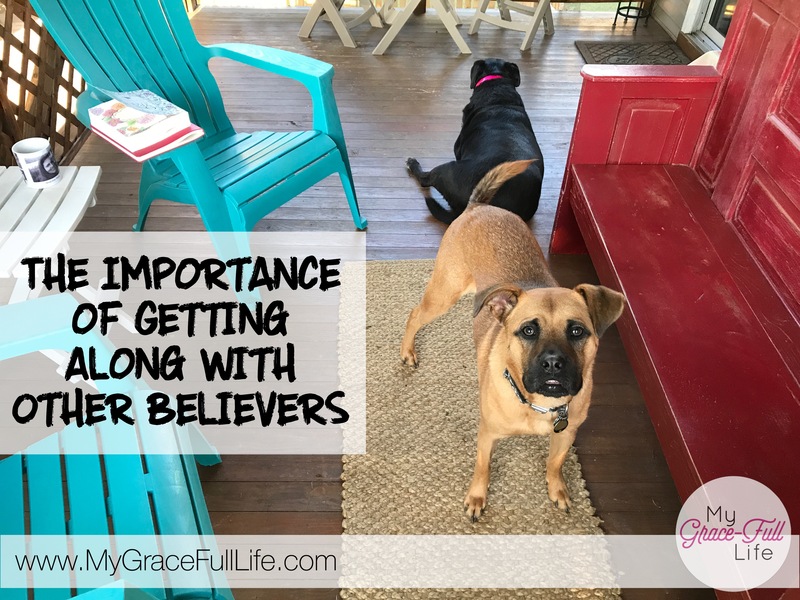 But as believers, we’re still people and there are going to be others – even other Christians – who we just don’t like. But we are called to work together for the common purpose for the Kingdom. Our differences don’t matter; we are a part of the church, the bride of Jesus. After all, the Holy Spirit gives us all different callings! And as a part of the family of God, we are to love each other, despite our differences. Today, as you pray, ask the Holy Spirit to help you embrace other believers as your brothers and sisters in Christ. If there are any differences, ask Him to help you focus on the common goal. After all, we might as well get along. Thanks to Jesus, all of us who believe will be together with Him for eternity!